BD-RE is the erasable Blu-ray disc format. This type of media can also be referred to as a rewritable format and is comparable to the CD-RW, DVD-RW, and DVD+RW formats except that the Blu-ray version provides more storage capacity and requires a blue/violet laser to be able to write information to and read the disc. This type of media is purchased blank. Information can be recorded to the disc but unlike the BD-R, this disc can be erased and then reused. An example of a brand or rewritable Blu-ray disc is provided in the photograph below. There is a limit as to how many times the disc can be erased, but for most discs they can be reused a minimum of 1000 times, which for most cases is much more than is required during standard use. Some better quality BD-REs may be erasable for up to 10,000 times. The single data layer version is the most widely available. There are not many manufacturers offering the DL or dual layer version and the XL version is even harder to find many options for purchase. There is no four data layer rewritable Blu-ray disc, as was the case for the BD-R format. Note that to ensure that media can be used on a particular burner, it should be verified that the burner can record and erase discs with multiple data layers. 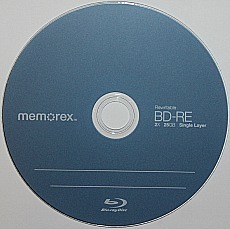 The structure of a rewritable Blu-ray single layer disc is similar to the BD-R and is shown below. The main difference from the recordable Blu-ray disc is the data storage layer. Instead of a dye or silicon/copper alloy, the erasable disc utilizes a phase change alloy. It is similar to what is used in CD-RWs, DVD-RWs, and DVD+RWs. The recording laser heats the crystalline phase change layer and converts it to a non-crystalline or amorphous layer. To erase the disc, the whole layer is reheated and upon cooling, coverts back to a crystalline layer and ready to store new content. Encapsulating the phase change layer are several dielectric layers that dissipate heat and make the technology function. 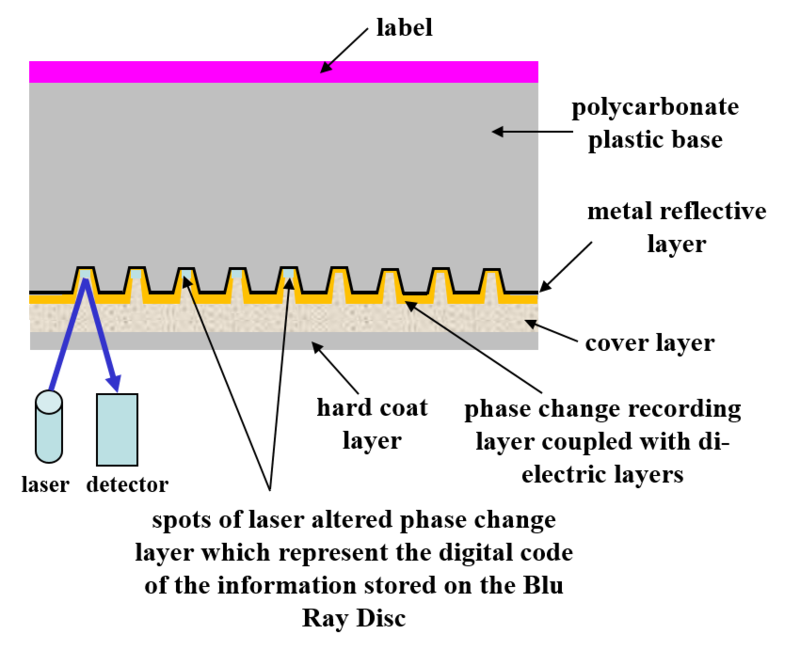 In the dual layer and triple layer discs, the phase change layer, dielectric layers, and metal layer, are essentially stacked on top on the single layer. BD-REs should be stored in standard jewel cases in standard room temperature conditions. Cooler and drier (within reason) are better conditions for storage. Warm or hot and humid conditions should be avoided. Do not write on the surfaces of these discs. Do not place adhesive labels on these discs. More advice can be found at the CD Storage page. The erasable CDs and DVDs have shown moderate to low stability respectively. There has been very limited research examining the stability of erasable Blu-ray discs. One study published in Restaurator, examined the accelerated aging stability of the BD-RE single layer discs relative to other optical discs. The research study showed stability relative to the CD-RWs and therefore, is given a moderate stability rating with an average lifetime range of 20 to 50 years assuming storage under average conditions. The multi data layer discs were not studied, but as with other discs with several data layers, the stability is likely low and less than 10 years. The erasable Blu-ray disc format is fairly new and provides very good storage capacity. However, due to the fact that it is not widely accepted in the marketplace at the moment and is erasable, this format should not be used for the long-term storage of important digital files and digital scrapbooking projects.